Release 40000.1.1: See change log for release changes. For configuration options, please use the blizzard addon interface or type "/ksa"
This addon was created to assist in reacting to the death of your totems, specifically for PvP, but further expanded on to include PvE usage. The end result is a highly configurable alert mod for totem deaths, whether for PvP or PvE. 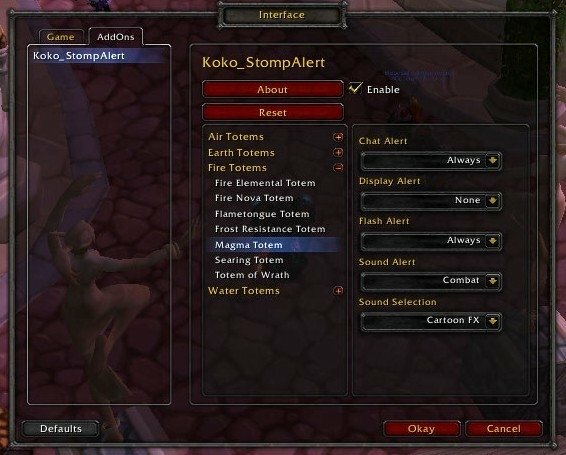 All the settings are as a per totem basis, so you can have multiple alert outputs for different totems. If you are a shaman and are into PvP and want to know when your important totems die, or just a decent alert for when you're magma totem runs out - then definitely give this addon a whirl. You won't be disappointed. - Default alerts are fairly lightweight, however due to the above it is highly configurable with many different types of alert configurations. - Should work across all languages. The addon will still be in English, however totem detection should work correctly. A fairly large update is planed, which may result in a change in the way you see and interact with the various configuration options. One advantage to this is the various alerts will be expandable. With the next major release, SharedMedia support will also be included. - "Combat" Only alert if you're in combat. - "PvP" Only alert if you're PvP flagged. I hope you enjoy this, its to Moo over. - Another update will be comming with some fairly large changes, including SharedMedia support. - Improved backend, should now work with all locals. *NOTE* This addon is still in english, but it should properly detect totems regardless of local. - Icon alert sizing improved. - Changing the RW/KSA icon size now adds a dummy alert so you can see the changes. - Better chat alerts, now with less chat window spam. - LDB now properly toggles the options menu. - KSA now only loads if you're a shaman. - Sound change. You can now easily add your own sounds, or add more WoW sounds. - Please see the new including "Adding Sounds.txt" document for adding your own sounds. - Database change. No longer resets your settings on update. - Movable icon alert frame. - Ability to adjust the icon spacing. This also sets a "demo" icon so you can better adjust the values. - Toggle Anchors now shows/hides both the warning frame and icon frame anchors. They also have text tags so you know which one is which. - A new global option: "Reset Anchors" which resets both warning and icon alert fram anchors - useful for resetting the positions without wiping all of your alerts via a settings reset. - The default position of the warning frame anchor is now in the center of the screen. - Minor code fix for icon display frame (left to right instead of right to left). - Couple more size options (tiny and huge) added. - Added code for using a placeholder icon graphic (which is used when testing settings or the icon is otherwise unavailable). - Added option to use the totem icon instead of a raid icon for the icon warnings. - Streamlined the default alerts for some totems. The default alerts should be better overall. - Added a movable alert frame. Looks and functions like the raid warning alert does. - Added a icon display frame. You can assign a raid icon (skull for example) to appear on screen if a certain totem dies. - Added sizing ability (small/med/large) for icon output for the warning and icon frames. - Added 2 new sounds. - Added icon support to chat and RW frames. Will not display an icon in party chat if you're in a group. 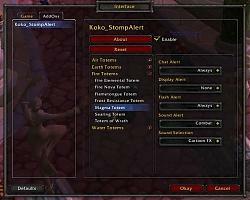 - Added option to test totem alert settings without dropping a totem. Note that all conditions must be met for the alerts to activate (I suggest the training dummies). Icons are unable to be used and/or may be incorrect with this option. - Added option to explain the various output condition types. - Fixed minor typos and error checking outputs. - Highly configurable due to the above. Hi, got a bug the other day when I used Spirit Link totem. I expect it's a general incompatibility with 4.1, but if anything specific is needed (or I'm wrong), please PM me. Last edited by Caramirdan : 05-19-11 at 06:37 PM. I'm actually planing on redoing a fair chunk of the code, just so it's a bit easier to maintain/read/update/add new things. However I will post a quick update with those changes for those wanting a fast update. I do think you're using an older version however, as the current release (30300.1.1) switched to spellID's. Last edited by kokomala : 10-17-10 at 12:43 AM. Planning on it. Working on finishing a couple of projects first, and then I'll be fixing/updating this. I can't give an actual estimate, except 'before cataclysm'. I will try to get it down within a couple of weeks though. Last edited by MAD111CAT : 10-16-10 at 09:24 AM. Hmm, it mostly fixed the issues I was having. I know actually have control over where the icon is displayed and there is no random text. What I meant by random text was that briefly before the icon displayed, if the icon was set to "large" or "huge" you would sometimes see the pathname to the icon file briefly before the icon actually appeared. I am planning implementing a slider for icon sizing (icon warning output only) at some stage. The RW and KW frames will still continue to use the preset "small-huge" sizing. I'm a little baffled by that large icon bug that you're experiencing, however I did notice you were using 1.2a and then realized I forgot to upload 1.2b to WOWI (only uploaded it to curse). I've just updated it to 1.2c both here and on curse. No real major changes but some slight coding changes in the backend and a minor sizing reduction for the icons. If you still experience the bug let me now. If you do experience the bug, try changing the size settings to see if that fixes it. Last edited by syeren : 02-12-10 at 04:03 PM. If you still experience the bug let me know. If you do experience the bug, try changing the size settings to see if that fixes it. My usual WoW addon setup I have used since before and during the progression of this addon. Today I tried a completely fresh install of the addon (WTF Files gone etc.) and the problem persisted. This is not abandoned. It still works perfectly fine and an update would simply be updating the toc file to the latest wow version. I have not come across the "huge" icon bug, and neither has this bug been reported. Under what conditions has this occurred? Yet another great Shaman addon which is abandoned by the creator, Kollektiv seems to be the only reliable Shaman author! Could you think about adding the option to choose how long the icon / KSA alert appears on the screen for? At the moment I find the Icon alert to last a little too long for my tastes, and I'm not great at lua, so I can't edit it myself. I threw a quick update together. Last edited by kokomala : 11-04-09 at 07:46 PM.